If you follow this blog with any regularity, then you have probably heard me mention Gabby and Gator and creator James Burks. James has a new picture book coming out on March 1st - Beep and Bah (Carolhoda Picture Books). And he has more good news. His graphic novel Gabby and Gator is being developed into a Television show. And it doesn't end there. In August, his newest graphic novel, Bird and Squirrel (Scholastic/Graphix), will be released. I have shared the Advanced Copy with some students and they are already singing its praises. Congratulations James - Looks like 2012 will be a wonderful year! In "Beep and Bah", "Bird and Squirrel", "Gabby and Gator", "Graphic Novels", "James Burks", "Picture Books"
On Friday, March 11th, we had a very special visitor at our school. Illustrator turned author, James Burks stopped by to chat and have some fun. The prize for the top four readers in our first annual Read-a-Thon was to have lunch with James. We started off with a Gator Pizza (pepperoni) and a Gabby Pizza (Veggies) and a cheese pizza just in case. Around the table, students asked James lots of questions about how he came up with the idea for Gabby and Gator. And of course, why does Gator like to eat dogs. James gave us all kinds of secrets at lunch. I had to sit on my hands so as not to grab my camera and take pictures of things I can't post yet. The students were so excited. They got to see a book trailer James made that won't be out until September, and a sneak peak at his new graphic novel to be released in 2012, and he even flipped through his journal. He then showed the girls how to draw Gabby & Gator. There is some surprising talent in this group. After lunch, we invited a group of students to participate in a modified Literacy Café. We rotated groups of students through 3 activities. One activity was centered around No Name Calling and how to respond when you are bullied (one of the themes in Gabby & Gator is around bullying and standing up to a bully). Children created their own comic strips talking about how to respond to a bully. They also made Gator bookmarks saying "My name is _______. Not _______." They filled in the last blank with a name that they had been called in the past. (In the book, Gabby says to the bully "My name is Gabby. Not Freak."). In the book, Gabby is very pro recycling and loves playing the Tuba. Gator enjoys dancing with her. Our Café participants made musical instruments out of recycled materials. Gabby would be proud. Of course, the students loved learning about how James' creates his characters and were mesmerized by watching James draw. No author visit would be complete without an opportunity to get a book signed by the author/illustrator. James was kind enough to sign books for students and draw in each book. In "Author Visit", "James Burks", "Literacy Cafés"
Congratulations! We have a Winner! 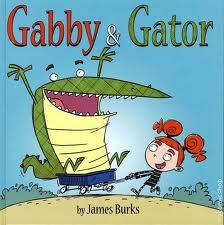 Congratulations to Marisa who won the signed copy of Gabby & Gator by James Burks. Your girls are going to love it. In "Contests", "Gabby and Gator", "James Burks"
I love Southern California. On any given week, you can attend several author events. Yesterday, I had a chance to attend the Book Party for James Burks' debut book Gabby & Gator. Borders/Glendale hosted the party. James' wife made vegan chocolate chip cookies (read the book and you will understand the connection), and friends, family, & new fans celebrated with Burks. It was a fun time. Back in April, I had a chance to meet James and some other illustrator/authors while waiting for Oliver Jeffers to arrive at a book signing. I have been highly anticipating James' picture book/graphic novel for months now. If you want to read my review of Gabby & Gator, click here. Alethea (@frootjoos) and the other great folks over at Borders/Glendale were able to arrange for the book party. James was a little nervous, but very excited. He kicked off the event with a couple of magic tricks to warm up the audience. And then did some drawings which were eventually given away to young fans. After some drawing entertainment, James read some from Gabby & Gator. He did just enough to hook everyone in. There was also a drawing for a painting of Gabby (the main character in the Gabby & Gator book). And this young winner was quite happy to win. James also took time to personalize each book with either a drawing of Gabby or Gator. Fans were thrilled. In celebration of Gabby & Gator, and to help get it into the hands of at least one reader, I am giving away a signed copy of James' book. Not only did he sign it, but there is sketch of Gator too. It is a great gift for a child or a teacher. The contest is open to U.S. and Canadian readers. 1. All participants must complete the embedded entry form. 2. Participants must be 13 years or older to enter. 3. All entries must be submitted by 11:59 p.m. PDT on October 15, 2010. 4. Participants must have a U.S. or Canadian postal address. In "Author Events", "Borders/Glendale", "Gabby and Gator", "James Burks"
Little Gabby doesn't quite fit in with the kids her age. She's more concerned about saving the environment than gossiping with girlfriends. Gator doesn't fit in - well, anywhere really. Flushed down the toilet when he was just a little snapper, Gator's closest friends are probably the dogs in the neighborhood around his sewer home - and he eats them! When Gabby and Gator meet, they find in one another that rare individual who will appreciate them for who they truly are. Over the past year or so, I have learned some things about publishing. It seems sometimes publishers make decisions that make it harder to promote a book or get it into the hands of readers. Additionally, authors, especially new ones, are limited in how much they can say or do about it. This is where bloggers or reviewers can get involved. We can get the word out about a book, where to find it, and help get it into the hands of readers. Burks' Gabby & Gator is a story of friendship, acceptance of individual differences, and empowering children to stand up to bullies. It is funny, quirky, and wonderful on many level. Burks' illustrations are bright, bold, cartoon-like, and draw the reader into the story. (I apologize for my lack of artistic terms...what I am trying to say is I enjoyed them.) Gabby is a little girl who follows a to-do list, eats a vegetarian diet, and recycles. The others children just don't get Gabby. Gator is a meat eater, afraid of toilets, and a little sensitive about being considered a monster. This apparent odd couple meet up and form an unusual friendship. Their acceptance of one another provides them with the ability to conquer fears and grow. I laughed while I read it (and lately I needed a laugh) and I never once wondered what the author was trying to communicate. It's a great book to have in a classroom collection. As an educator, I look at a book from the perspective of which students can I give a book to and why. Burks' Gabby & Gator is essentially a middle grade graphic novel. Yes, it is hardcover, and yes it has wonderful illustrations, and yes, adults can read it to preschoolers who will laugh and enjoy it. However, as a picture book for preschoolers, it is technically a little long. At 100 plus pages, it is about three times as long as a normal picture book (though about as many words if not less on a page than a normal picture book). So parents will really need to know their child's attention span. I could see this being difficult to use in a kinder class as a read aloud. Where I do see it being most effective is with second graders on up. Teachers could read it with a class as part of a discussion on accepting individual differences or talking about standing up to bullies. And children within this age group (2nd to 5th) can read the book independently. For reluctant readers, the limited amount of text will allow for them to read the book and have success and would be a good segue to more formal graphic novels or graphic novel/chapter book hybrids. In "2010 Debut Author Challenge", "Book Reviews", "Hachette Book Group", "James Burks", "Yen Press"